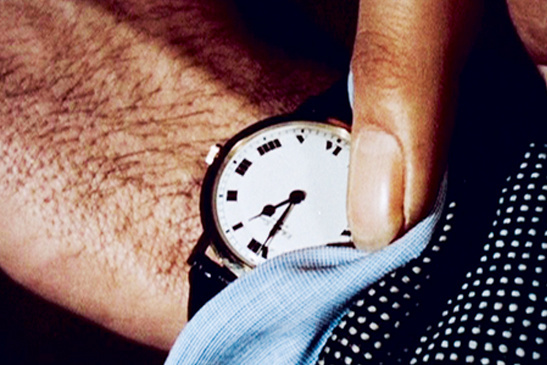 Christian Marclay, 'The Clock', 2010, single channel video, duration: 24 hours. Image © the artist. Courtesy White Cube, London and Paula Cooper Gallery, New York. OK. It’s official. I’ve been in denial for a while now, but since the MCA failed to invite me to their grand re-opening, which was surely the art scene event of the year, I’ve been forced to admit it. I’m off the A-list. It’s hardly a surprise. I haven’t written for the SMH for a few years now, and as someone who barely drinks and can’t be bothered with the schmooze, I never really did it right anyway. So over the Easter long weekend I went to take a look along with the rest of the hoi polloi. And the MCA was packed! In fact, it was so busy you could barely see the art! But I did get up to the new sculpture terrace, which sports a stunning view and a new sculpture by Hani Armanious titled, Fountain. This work consists of a very large, vaguely anamorphic piece of marble (which resembles a piece of eroded sandstone crossed with a statue of a winged Assyrian lion) perched on a verdigris covered bronze replica of a cheap plastic outdoor table. No doubt it is cleverly ironic, but I found it so spectacularly ugly that it was utterly compelling. A bit like a train wreck (in the nicest possible way) you just can’t look away. Maybe that’s the point? And I also managed to snag a seat on a couch and caught a few minutes of Christian Marclay’s epic video, The Clock. I had high hopes for this piece, since everyone seems to rave about it. (Spoiler alert! If you know nothing about the work you may want to skip the rest of this paragraph and save the surprise.) A friend of mine, who had seen it in Venice, described the thrill of the “light bulb moment” when she realised that all the clocks in the multiple snipped movie clips are synced to real-time. And that’s what was missing for me. Knowing this fact going in kind of spoiled the piece. Sure it’s an exercise in editing (and research) virtuosity, but without that surprise, “ah Ha!” revelation, it lacked a certain something. And this raises an interesting question. I already know it’s best to approach art with no (or low) expectations. But is it also best to go in knowing nothing at all about it? I suspect a generalisation won’t work here. Some art is more satisfying if you know quite a bit, while some benefits from total ignorance. In this case, the publicity machine has given away the punch-line, and, having already written about this work, I am complicit. The crowds kept me from spending much time with the other shows. I’d interviewed curator Rachel Kent previously about her group show, Marking Time, and she frequently described the works she had selected as “quiet”. But the crowds at the MCA were anything but, so subtle works like Katie Paterson’s sound piece, Earth–Moon–Earth, (which incidentally requires a fair bit of knowledge to appreciate, such as the fact that Patterson translated Beethoven’s Moonlight Sonata into Morse code and collaborated with ‘moon bouncers’, a specific clique of amateur radio operators, in order to send the music on a return trip to the lunar surface, then re-translated it back into music complete with the Moon’s mistakes) was completely drowned out by happy, chattering gallery visitors. I guess it is possible to be too popular for your own good, or at least for the good of the art. So for me, the best part of the new MCA was just wandering from the new right back into the old. There was something pleasantly uncanny about entering the old familiar galleries from a new direction and finding them basically still the same. I liked that. And it was a surprise. The MCA’s re-opening season includes: Marking Time, Christian Marclay’s The Clock, Hany Armanious’s new work and Collection Volume 1, selected from the MCA’s permanent collection. Until June 3, 2012. What an annoying friend! Great that the piece has come to Sydney 🙂 how long did you ‘watch’ it? I watched it about 15mins I guess? It was still kinda impressive. And interesting how gratifying it was when a clip came up that was familiar!